'Dressed to Kill' ( Paul Black, R. 2006). Seedling K225A. TB, 38" (97 cm), Midseason thru late bloom. Standards brassy gold center and diffuse margin, medium slate-violet area shot with brassy old-gold veins between; style arms butter edges, violet ridge, slate crest, brassy gold edge; Falls dark red-purple blending to wide paler greyed red-violet band, red violet center stripe from beard to edge, iridescent; beards marigold in throat, dull marigold in middle, violet at end; slight musky fragrance. 'Cranberry Sauce' X 'High Class'. Mid-America 2006. From Mid-America Garden catalog, 2006: DRESSED TO KILL - TB, 38" (97 cm), Midseason-Late. Stepping into the night, she's Dressed To Kill; visually, for sure; literally, perhaps. Stick around and see. Dressed To Kill presents a provocative melding of softer neutral tones with strong, bold colors. Standards are soft mink gray. Centers and moderate band around edges have a subtle greenish overlay and veining. Ruffled falls are pulsing black-cherry that blend to red grape toward margins and finally to whitish grape at edges. 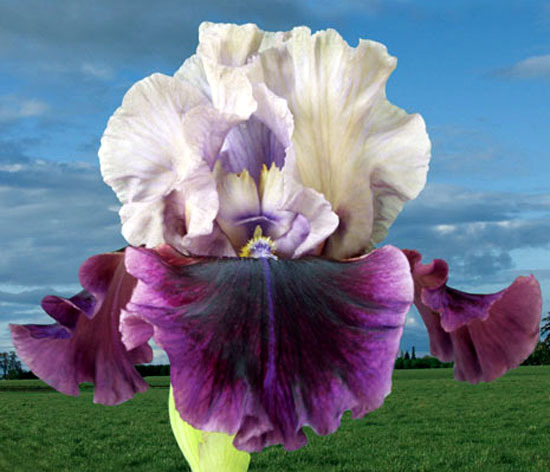 Unusual beards mirror the flower colors with 3 layers, white, purple, and smokey yellow. Sometimes there is an iridescent grape center fall stripe. Sure to win, show stalks have 3 branches and 8-9 buds. Robust growth provides pleasing clumps of healthy, blue-green foliage. Sdlg. K225A: Cranberry Sauce X High Class. $50.00. jpg IMG_2216-X2_dressed_to_kill.jpg manage 245 K 17 Feb 2016 - 04:14 BrockHeilman Please contact Brock Heilman for image use.